I love this bag because, I like big handbags, it holds my tablet, a book, my umbrella and so much more. I would recommend this product. Step out in flawless style with this stunning satchel. 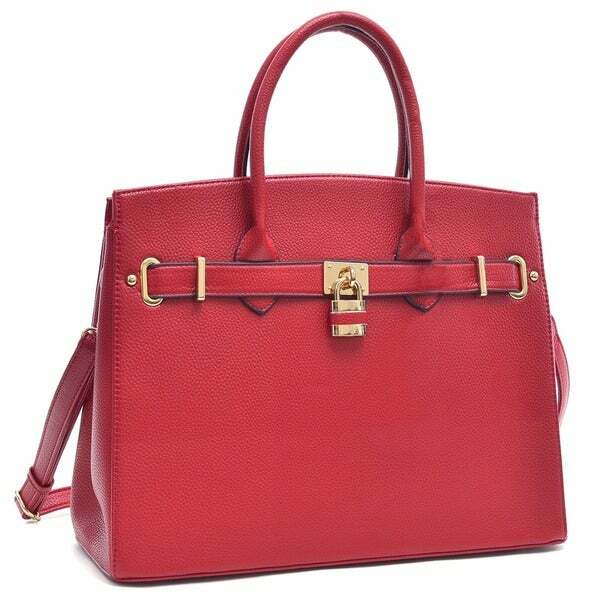 Available in a wide range of color to pair with any ensemble, this handbag is made from luxurious leather and features goldtone hardware details and double rolled top handles. Dimensions 15.0 In. X 12.0 In. X 6.0 In. The bag really is awesome! I have a small amount of makeup, my wallet, a compact umbrella, a couple of drinks, my Daytimer (padfolio size), and various other small items in the bag. There's plenty of room. The strap, however, doesn't hold up to the weight that a bag that size can carry. The hook broke (not the strap) the second day I had it. UPDATE: Overstock is awesome!!!!! I recieved an email stating a new bag was being sent. They also included the return label to send the defective bag back. Most companies wait on the return before sending the replacement, but I received my new bag the day before shipping the old bag back. So far, so good. As I said before, the bag has plenty of room and it's beautiful. The strap seems to be holding up, so I'm guessing I just got a bad bag in the beginning. As of right now, I'd recommend this bag to anyone needing to carry extra supplies around while still looking classy. I purchased this bag for a Christmas gift. 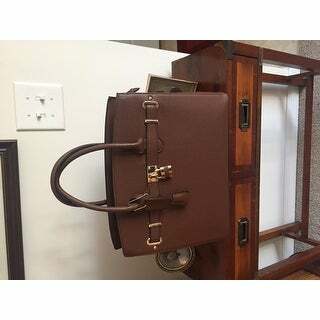 I ordered it in light Brown, when I received it, it looked as Red as a Big Red Apple even though the label on the Hand Bag stated that the color was Light Brown. I decided to keep this Bag for myself since it was a great buy ( under $*). I'm giving it a 5 star rating because it is well made and for this price it came with a DUST BAG, VERY SURPRISED. I was disappointed with this bag. The bag included a warning that is no where on the overstock site when you purchase it that states "The State of California Proposition 65 requires that we include the following warning: Warning: This product contains a chemical known to the State of California to cause cancer and birth defects or other reproductive harm. My husband and I are trying for a second child so I sent the bag back. I did call overstock prior to mailing the bag back and told them why I would be doing so and the customer service person told me I would receive a refund, but I had to pay about $10.00 in shipping fees - which I truly do not think is fair since I would have never purchased the bag in the first place if I knew it contained a chemical that causes birth defects. I did not even want to gift it to someone knowing the above so I will just take the loss. Too large for a petite woman like me but nice looking and good quality for the money. I gave it to a friend and she loves it. I love the size, pockets, and the look of this bag. It is a little stiff. I don't know if that is because it is faux leather or because it is new. Not really an issue. Stylish bag and well made for the price. Awesome Quality Handbag, lots of storage and Top Quality, beautiful color, storage bag and all! Many, Many Compliments~ The Bag and Brand Have it! The handles on this bag are a little awkward, you cant put it on your shoulder like you want to when you walk. The pouches on the inside are pretty tight, I almost couldn't fit my macbook air in it. I like the way it's made,the way it came in the bag. I get a lot of compliments on this purse. I've told a lot of people where to get it. The bag is heavy, but roomy. It is very stylish, and secure with a padlock on the front. The strap provides additional security which I relish. Recommend this bag to anyone interested in security. love my bag,,,,,,,,it's bigger than expected, but I'm happy with it. The purse is so beautiful. I love my faux Berkin bag! I've received so many compliments! Pictures to come! Great bag. It is a bit stiff which doesn't allow much flexibility when trying to squeeze items in. Overall I like the bag. Beautiful Red leather Purse! Definitely will be buying other colors. Customer this is a beautiful purse to own. It's a showstopper! Will make a excellent gift for someone. I am in love with this Purses! Certainly will be buying other colors! I wanted a red bag and the size was great. However it did not wear that well! I had numerous compliments on this handbag. I received tons of compliments. It could hold everything and files. I could slip a small laptop and felt like it was perfect for after the office. "is this a hard or soft faux leather feel?" This item is a hard faux leather feel. "How soon can you restock the light blue?" "How wide is the bag at the opening? I need to a 13" laptop width-wise." It works! That's what I have and mine fits! Love this bag. "What is the height of this purse? Descriptions says it is 2.75" high but I know that's not correct." It was too big for me so can't measure gave away. I'll say12.75". It's a little over 11" high not including the handles. It is bigger than I expected which is good and bad. Can hold quite a bit. "Is this available in the green ?" The green is currently out of stock. Unfortunately, we do not have a restock date for this item. We apologize for any inconvenience. "Are these purses made of real leather? One part says leather and another part says faux leather." We will request an update. The title is incorrect. "Are all interiors polka dot? (specifically looking at the black bag)"
I purchased the red one and the interior is black with red trim. Very nice and I really like it. I have been using it for 2 months now.